A latest Career advertisement has been advertised as SWR recruitment by South Western Railway. Hard work and result oriented candidates can fill online application forms for 81 vacancies of senior / junior technical associates before the deadline of February 1, 2019. More information about the applicants who are applying for SWR jobs and SWR recruitment 2019 can be obtained through this page, which is created by the team of www.telanganaa.in. Eligibility: Candidates must have completed Diploma / Bachelor Degree / B.Sc in Engineering / M.Sc. (Electronics) or equivalent with good marks from any recognized University / Institute. Candidates applying for any of the above posts and candidates belonging to General / OBC category will have to pay the application fee. 100 / -. SC / ST / Female candidates will be exempted from payment of application fees. Claimants who want to join this organization should be from 20-02 to 33 years (post1), 18 to 33 years (post 2) 01-02-2019. Applicants' engagement against this recruitment will be done on the basis of their presentation in merit list / gate score card, screening and verification of the document, which will be organized by the recruitment panel of the organization. First of all you will have to open the official site of the organization which is http://www.rrchubli.in. Online registration of online application is from the beginning: 10-01-2019. Last date for online registration: 01-02-2019. Click SWR Recruitment Notification here. 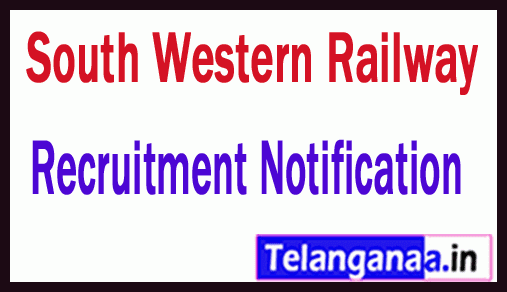 A vacancy notification related to SWR recruitment has been issued by South Western Railway to inform qualified and hardworking participants for 30 vacancies of stenographer. Eligible candidates can apply for SWR vacancy by submission of application form before deadline 18 January 2019. Essential Education: Candidates must have completed 12th / stenography knowledge / certificate course in MS Office or equivalent with good marks from any recognized University / Institute. Salary details: Candidates appointed for stenographer positions will get Rs. Will get remuneration 19,500 / - which is offered by South Western Railway. Applicants' engagement will be done on the basis of their presentation in the Medical Examination and Stenography / Computer Based Skills Test against this recruitment, which will be organized by the recruitment panel of the organization. First of all go to the claimant official website which is http://www.swr.indianrailways.gov.in. Once the application is successfully filled, the participants should send the completed application form at the postal address which is mentioned below. Application latest to be sent: 18-01-2019. A recent career advertisement named as SWR recruitment has been spread by South Western Railway. Efficient and well-qualified job applicants can submit their applications through online mode for 963 vacancies of apprentices till the expiry date on January 16, 2019. Job seekers who wish to nurture their careers with this prestigious organization, can apply against SWR jobs and can get full details of SWR recruitment 2018 from this page created by the team of www.telanganaa.in. Qualification Required: Job searchers should have passed 10th / ITI (NCVT / SCVT) with a good academic record from a well recognized institution / board. Scheduled Castes / Scheduled Tribes / Women / PWD candidates will be exempted from the payment of application fee. Candidates should be between 15 to 24 years on 16-01-2019. The job hunter will be selected on the basis of their performance in the merit list organized by the selection committee. To open the official site of http://www.swr.indianrailways.gov.in, you must first open all the applications. The open date of online submissions of the application is: 17-12-2018. Dead line of online application is: 16-01-2019.